A good design can be timeless and the Fairbairn Sykes is a perfect example of this. These pages will be dedicated to knives inspired, either in style or authorship, by the Fairbairn Sykes. We will include examples that extend from WW-II to the current wars in the mid-east. For example: Fairbairn designed Cobra & Smatchet, Randall Model 2, Gerber MK-II, etc. 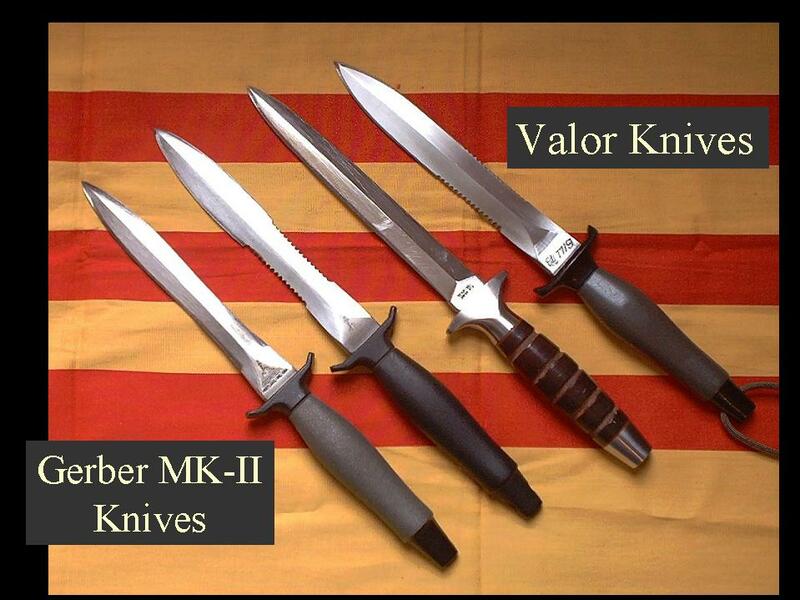 Some Vietnam era daggers are shown below for your viewing until I have time to fill out this section. The top two knives are made by Valor (Seki, Japan) and are an obvious copy of the more expensive Gerber MK-II knives (Portland, Oregon USA). The blood line of double-edged daggers continues, with many individual makers seeking to create the perfect fighting knife. People like Peter Bauchop of South Africa, Al Mar, Walter Brend, Bill Harsey, and dozens of greater or lesser known makers have toiled over forge or grinder producing quality fighting knives and daggers. Wartime soldiers and sailors made their own versions, known as "Theater-Made" knives. 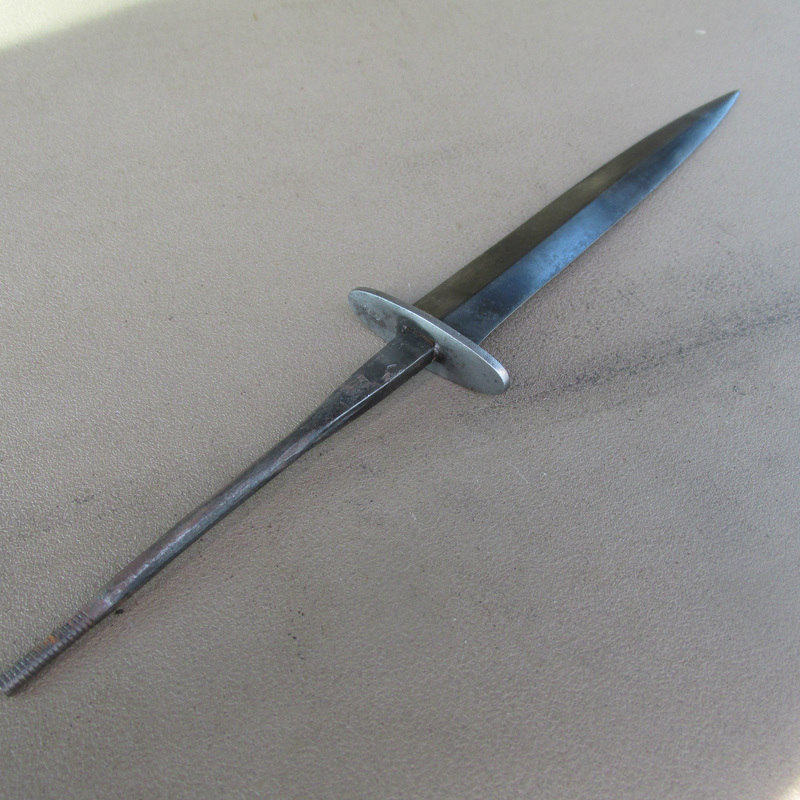 Many were ground from bayonets, files, or random pieces of steel. Many of them were of dubious value as a fighting knife and may have just helped the serviceman while away some time or give him a sense of confidence. 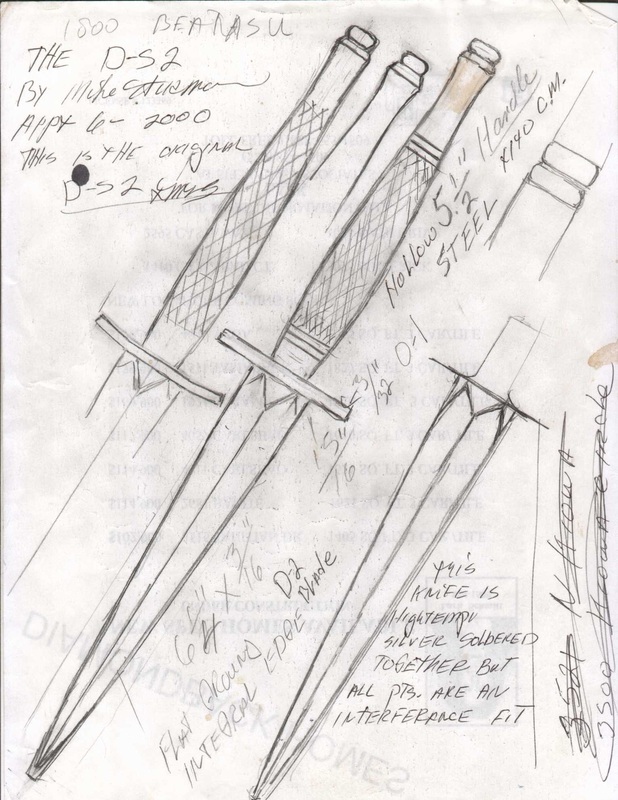 The following sketch is one of the knives I collaborated on with a fellow Vietnam Veteran who made the knife for. It is almost an injustice to list Ek Knives under the category of derivative designs. Who knows when Man first decided to make a double-edged fighting knife but it was not a WW-II innovation. Most writers point the finger at the ancient Greeks and Romans. The actual date or time of its inception matters little. We know that it makes a deadly efficient weapon. This is not an Ek, Randall, or a Gerber site, and I am not claiming to be an expert on any of those brands. There is one difference with Ek that makes it more a parallel design than a derivative one,and that difference is a critical one. All Ek Knives, despite the model, share one common characteristic and that is full tang construction. Because of the strength that one difference provides I can say that I have never seen a broken Ek Knife. Yes, I have seen a few that were "sprung," ones with loose or broken handles, but never one with a broken blade. To a man at arms that is one very important difference! Most of the other knives on this site (Gerber not included) use what is referred to as a rat-tail construction. This design factor is quite often the source of their failure. All styles of Ek knives share one other characteristic, one that might be called an "economy of design," or simplicity of line. This might have been a Scandinavian trait of John Ek or purely a manufacturing decision. Another major difference was the many choices afforded an Ek customer compared to any other manufacturer (other than Randall Made Knives) of fighting knives. This capability was, again, due to the flexibility provided by grinding blades to shape rather than forging them in dies. Essentially what I am describing as "differences" were in reality distinct advantages. One of Ek's post WW-II designs was an improved combat bowie available in either single or double-edged format. These Bowie knives, as well as Ek daggers, have been quite popular during the recent spate of wars in the mid-east. Bo Randall and company (Randall Made Knives) also provide some of the finest fighting knives in the world. They are listed in their own right.